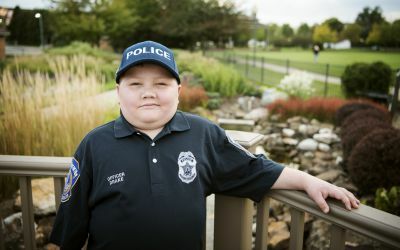 Drake Price, 12, has always loved helping others, so it was no surprise to his family—parents Miles and Charity Price and four siblings—when Drake declared during second grade that he would be a police officer. “He’s just a kid who wants to help everyone, from looking after the little kids to helping our elderly neighbor with her garden,” Charity says. What his family didn’t know at the time was how important Drake’s passion for law enforcement would become years later. In early 2017, a trip to the emergency room revealed Drake had a baseball-sized tumor in his brain. 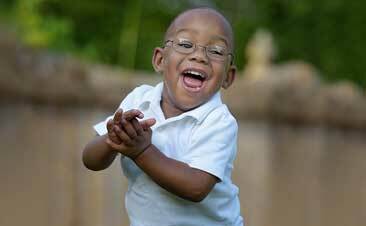 Drake was taken to Riley Hospital for Children at Indiana University Health, where Riley Pediatric Neurosurgeon Dr. Jodi Smith spent 13 hours removing the craniopharyngioma—a type of aggressive, noncancerous tumor found near the pituitary gland. Knowing Drake’s law enforcement aspirations, Smith reached out to a friend from her church, Indianapolis Metropolitan Police Department Chief Bryan Roach, to see if he could visit Drake. Roach talked with the Price family and, with their permission, gave Drake a blessing. 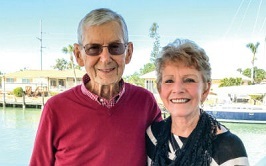 “Drake was barely conscious when Bryan came in, but he gave him the blessing, and it wasn’t too long after that that Drake started to wake up,” Dr. Smith remembers. Drake had a second brain surgery at Riley in June and finished radiation treatments in Chicago in September. In that time, he’s also had countless police visits and collected more than 2,500 law enforcement patches from as far away as Iceland and Australia. The Price family credits their community, Riley Hospital, and, above all, God, for helping them stay positive in the face of repeated obstacles.